NOT part of my regular series, here is the legend of Tametomo, as I imagine it. The original story states " it is said that he once sunk an entire Taira ship with a single arrow by puncturing its hull below the waterline". How boring. One day, Tametomo was enjoying some hot green tea in his house. When all of a sudden, a giant iron ball came crashing through Tametomo's roof, stopping it's trajectory about 10 inches from Tametomo. So Tametomo pulled-back his bow aiming straight for the dragon's mouth! His arrow went straight in the dragon's mouth, triggering some gunpower and in turn destroying the front of the ship, which then sank. 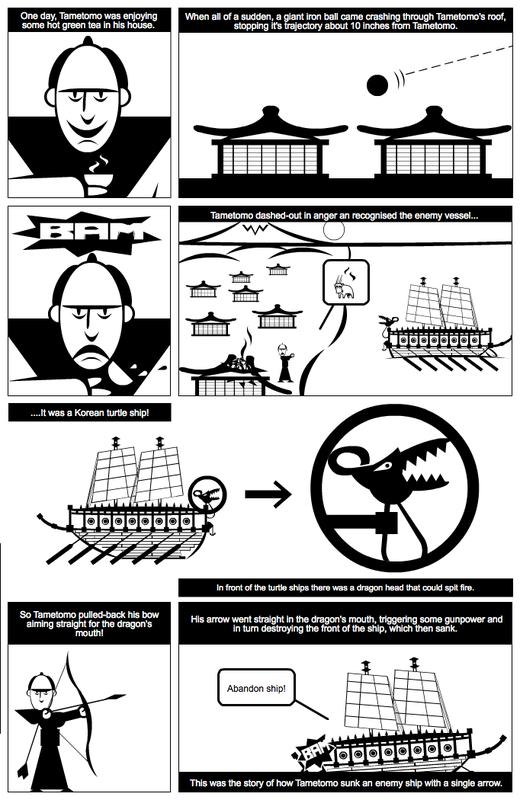 This was the story of how Tametomo sunk an enemy ship with a single arrow. ....It was a Korean turtle ship! In front of the turtle ships there was a dragon head that could spit fire. @NooniePuuBunny Finally! Someone notices! Yup! @maoriman Thinking similar thoughts. THX! Darn left that frame there in the bottom left! Grrrr.